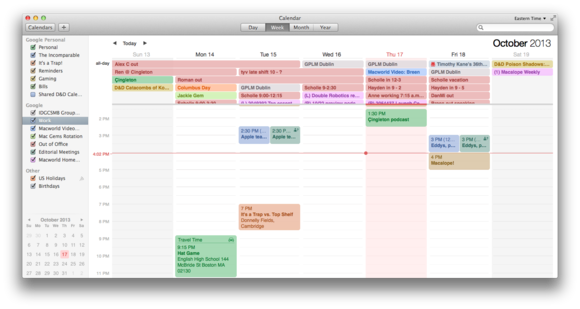 A lot of users shied away from OS X’s built-in Calendar and the stitched-leather look of its Lion and Mountain Lion incarnations, but in Mavericks the app returns to its former sleek glory—and it has learned a few tricks, too. When you launch Mavericks’ Calendar app, the new-old aesthetic will grab your attention. Gone are the skeuomorphic flourishes of the previous version: the marbled leather title bar, the page tears, the embossed button. Calendar has also gotten a smooth, sleek makeover, with an emphasis on thinner, lighter fonts reminiscent of how Apple has transformed iOS 7. Likewise, events have a flatter appearance; though they’re still translucent, the effect is less pronounced than in previous versions of Calendar. Calendar’s new aesthetic is slim and simple, with a flatter and less translucent visual experience. Subtle cues highlight handy information: For example, in the month or year view, a red line indicates the current week. In the year view, the current month is highlighted in red. And the terminator line that shows how far you’ve progressed through your day now actually tells you the current time instead of making you eyeball it. Beyond the app’s overall look, perhaps the most substantial makeover for Calendar comes in the event inspector. Mavericks has entirely redone that tool, though you can still view it either as a pop-up or as a separate window. Only the info you need: While the event inspector still contains all of the relevant information about an event, such as place, time, and invitees, it does so in a far more compact way; the labels are gone, since Apple presumes you can distinguish between, say, a date and a list of names. If you want to edit an event or add information that’s not included, clicking the date expands the window to offer additional fields, such as time zone, travel time, an alert, and availability. But Calendar also understands that you don’t necessarily need to see that information at a glance. The event inspector has more information, including a map and a forecast, but shows it off in a more compact form. Travel time: If you often travel for your appointments, you’ll find another of Calendar’s new features invaluable. When you’re creating or editing an event, you can click the date and time and add travel time. So if you’ve got a 2 p.m. appointment, and it takes 30 minutes to drive there, you can have Calendar demarcate that 30 minutes so you don’t accidentally miss an appointment. You can specify whether you’ll be walking or driving to the appointment, and alerts even take that into account, so Calendar can alert you 10 minutes before you need to leave, regardless of how you’re traveling. Quicker event edits: Frequent calendar users will be glad to find you no longer have to double-click an event, and then click Edit, when you want to change the details—double-clicking now automatically brings up a window for easy editing. Mavericks’ version of Calendar has a few other niceties, such as a built-in calendar for U.S. holidays that you can activate in Preferences, in addition to the existing Birthdays listing. Moving between weeks is a lot smoother, too, thanks to continuous scrolling, which also prevents the calendar from snapping in week increments—if you want to look at a Wednesday-to-Tuesday view of your week, for instance, you can do that. Frequent Facebook users will be glad to know that Calendar can now handle events from the social networking service, adding to its existing support for iCloud, Exchange, Google, Yahoo, and other CalDAV services. All in all, Mavericks' version of Calendar is a step-up from its predecessor, and no cows were harmed in its making.